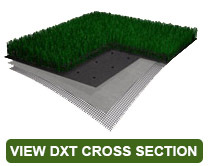 Deluxe Athletics’ synthetic turf systems were created on the principle of educating the client to a specific comfort level so that they can make the proper choice on the exact product that will best benefit their organization. Deluxe Athletics has been involved in every aspect of the industry and has carefully studied and evaluated all processes and products available on the market today. With the knowledge available from over a decade of industry specific construction experience, along with continued technical development and careful assessment, Deluxe Athletics is the best choice for the installation of an athletic field. We will never push a client toward a specific style or system, instead allowing them to make their own educated decision based on facts, testing, and proven performance. Quality, safety, durability and installation capabilities should be the driving factors of your decision process on not only the system, but the company responsible for the entire project and aftercare. Deluxe Athletics, with the different systems available and, coupled with our high-level construction principals, is the only company that can satisfy all of your organization's needs. The Deluxe Athletics’ product philosophy has been developed utilizing only the highest quality fibers, backing, coatings, infill, and installation processes available in the industry today. It is your field, and we will build it together. The overall durability of your field is related to two things. First is the backing system, which creates the foundation. Second is the fiber matrix and infill correlation, which will need to handle the daily wear and tear required by your field and provide not only the aesthetic appearance but performance characteristics needed over the life of the field. Utilizing better backings and the proper fiber and infill components equals a longer life of your field.